As you know, after my original Makeup Breakup panic, I have been slowly incorporating more and more cruelty free products into my makeup bag. Since most cosmetic brands try to keep their animal testing hush hush, it can be a struggle to find the truth in their policies. So I’ve had to do some serious digging. But alas! I have found three brands that I can confidently share with you. And for your convenience, I’ve made sure all of these products are available at Sephora aka the makeup emporium. tarte is known as a leader in eco-chic cosmetics. They pride themselves on providing products that are healthy and natural, but glamorous at the same time. I think tarte is best known for their blushes. I have never heard anything bad about them and I personally love them. I have both the powder and the stain blush and I like them each for different reasons. The powders are made with Amazonian Clay, which is harvested right from the banks of the Amazon River. Sustainably harvested of course. The clay is rich in nutrients because it picks up fruit and plant matter as the river flows along. Then the sun naturally bakes the clay, which locks in all of the nutrients. Pretty cool, right? The cheek stains are made with extract from the longevity fruit aka the goji berry. Goji berries are known to help with skin conditions like allergies, rashes and psoriasis. So this product is excellent for people with sensitive skin. Both blushes have serious staying power. I don’t think I’ve every worried about reapplying during the day. The powders provide build-able color, while the stains give you more of a natural tint. I was nervous about using a cheek stain for the first time, but I assure you, if I can figure it out, you can too. It takes about 20 seconds for the stain to dry after you apply it, which is plenty of time to blend out and fix any mistakes. Sometimes I even use the stain on my lips. I dunno if you’re supposed to do this, but I like it! Bite Beauty only sells lip products. So you could say they’re pretty much lip experts. They offer everything from glosses to scrubs to balms, sticks, pencils and everything in between. They even offer a moisturizing lip mask, which I find incredibly intriguing. 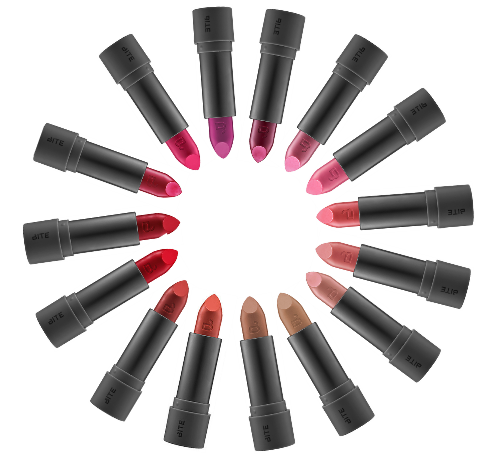 Their mission is to “create lipstick that is high performance and healthy enough to eat”. Now I’m not saying you should go take a big bite out of your lipstick, but making lip products safe to consume kind of makes sense because you’re bound to get a little in your mouth. I know I’m guilty of getting lipstick all over my teeth! So many pretty colors! See any you like? Julep is all about celebrating ladies! The brand functions on the idea of women connecting with each other instead of competing against each other, which I think is a great message. They also give back to women by donating $1 of every nail polish sale to an organization that empowers women. Right now you can buy their “Malala” polish (below) and 100% of the proceeds go to the Malala Fund. Along with giving back, Julep works hard to keep icky chemicals out of their products. All of their polishes are “five free”, which means they don’t contain: Dibutyl Phthalate (DBP), Toluene, Formaldehyde, Formaldehyde Resin, and Camphor. These are all potentially harmful chemicals usually associated with nail polish. Their polishes use a patented oxygen technology, which allows 30% more air to reach the nail bed and helps to keep nails stronger and healthier. This technology also makes the polish dry faster and last longer. Below are a few colors from their September 2014 collection to get you ready for fall, which is inevitably on the way. These obviously aren’t the only three cruelty free brands at Sephora, but they’re a good place to start. I’ll keep you posted as I continue to find more and more. And I’m always up for suggestions! Categories: Uncategorized | Tags: Beauty, Bite Beauty, Blush, Cruelty Free, eco-chic, Health, Julep, Lifestyle, Lips, Makeup, Nail Polish, Skin Care, tarte | Permalink. I just found your blog today and it’s awesome. Your posts are really great! I have one of Tarte’s Amazonian clay blushes and I love it. I def need to try out more of their products. Next on my list is their Amazonian Clay 12 Hour Full Coverage Foundation which I hear is really nice!